There are many small sailboat builders who had passion, good designs and quality craftsmanship that are no longer in business. The sailboat market can be fickle. Demand ebbs and flows. Niches grow and shrink. Fortunately, many sailboats from years ago survive the market conditions, unlike some of their respective builders. Today we're left with a few choices in the pre-owned market for small, trailerable weekend cruisers. If you're shopping, don't overlook some of the smaller builders like Helms Yachts. Helms Yachts were built in Irmo, South Carolina during the 1970s and early 1980s by Jack Helms. To the best of my knowledge, only 600-800 total boats were built throughout the Helms line. Jack supposedly personally delivered most of the boats. The company's first boat was the Helms 25. Eventually a 27 was added, followed by a 30, which was later replaced by a 32 footer. Several hundred of the 24, 25, 27 and 30 foot boats were built, but only 10 of the 32 footer were ever built. Jack Helms is rumored to have said that he wanted to create a "better Catalina 22/25" when he began his company with the Helms 25. Jack is credited with both the construction and design of the Helms 25, while he relied on design services from Stuart Windley and John Holmes for the design of other boats in his product line. The boat looks very similar to a larger scale Catalina 22, except for an extended cockpit on the Helms. This extension allows the Helms to comfortably seat six in the cockpit while daysailing or two to four while cruising for extended periods. The cockpit also features large lazerettes and a teak coaming box on either side for storage. The mould for the Helms 25 was adapted from a Venture 24 hull with a nearly full-length skeg added to the keel of the boat. The hull is solid fiberglass while the deck has a wood core. The Helms 25 also features a hinged retractable centerboard design, making it a great gunkholer and trailer-sailor. In fact, these boats were originally sold from the factory with a custom tandem axle bunk trailer. Many owners still maintain and use the original trailers. Total displacement is 3950 pounds while ballast is 1650 pounds, including the 300 pound centerboard. The centerboard is controlled via a cable and winch located just under the step inside the companionway. Draft with the centerboard up is a scant 20 inches while draft with the board down is a full 6 feet. Length overall is 24 feet 10.5 inches, while length at the waterline is 21 feet 6 inches. The beam is narrow at just 7 feet 11.5 inches. The Helms 25 was rigged from the factory as a masthead sloop. She has a transom hung rudder with tiller steering. The rudder will kick up in shallow water if a bolt or pin is removed, thus adding to the boat's shallow water resume. In fact, with the centerboard retracted and the rudder in "kick-up" mode, the Helms 25 can be safely beached. The original running rigging features end-boom sheeting with a transom traveler bar for the mainsheet. The headsail sheets are lead aft through outboard adjustable car tracks. The boats came with two rather smallish primary sheet winches and a third mast mounted halyard winch. One unique feature of the Helms 25 rigging is a rolling boom, which is handy for mainsail storage and reefing (more on that later). The deck-stepped mast features a rather typical standing rigging arrangement: one set of spreaders, forestay, single backstay split at the transom, double lower shrouds, and single outer shrouds. The chainplates for the lower shrouds are attached to the deck and backed by rather small stainless steel plates. I recommend enlarging these backing plates for added strength. The outer shroud chainplates are attached through the deck to a teak bulkhead in the cabin. There is a single lifeline running from the stern pulpit to the bow pulpit on each side of the boat. On my boat, the middle stanchions are backed by appropriately sized stainless steel plates while the stanchion backings that are less readily seen are backed by marine grade plywood. The wood backing plates should be replaced with steel backing plates for added strength. The cabin layout is typical of a small cruising boat. There is a large v-berth forward that has plenty of shoulder and legroom for two adults. Just aft of the v-berth is the porta-pottie to port. Later models (after 1975) feature a small open hanging locker to starboard. Earlier models such as mine simply have the v-berth extend aft a bit further. Moving aft is either a full or half height teak bulkhead on either side with a teak mast compression post on centerline. Next to port is a convertible dinette table that comfortably seats two adults but will accommodate two adults and two children with a bit of elbow and hip rubbing. With the table converted to a bed, there is ample sleeping room for two children or one adult less than 6 feet tall. To starboard across from the dinette is a compact "galley" featuring a poorly insulted icebox and a small stainless sink with a handpump faucet. Just aft of the galley on the starboard side is a cushioned bench that extends into a quarterberth under the cockpit. The quarterberth is suitable for sleeping one child or an adult who doesn't need much shoulder room. Aft of the dinette on the port side is a sail locker accessible by tipping the aft dinette seatback forward. There is ample storage throughout the cabin beneath all seats and berths. However, most of these storage areas are directly in the bilge so items should be kept in sealed plastic bins. Ventilation for the cabin is provided via the companionway and two deck hatches, one over the head of the v-berth and another smaller hatch near the foot of the v-berth. There is plenty of natural light in the cabin from the two large and rather dated plexiglass portlight windows on each side. The companionway hatch also slides forward far enough to give plenty of additional light and ventilation. The biggest drawback of the cabin is the lack of standing headroom for anyone more than 5 feet tall. This issue was partially addressed in later models with the addition of a pop-top option. Auxiliary power for the Helms 25 comes via an outboard motor mounted on an adjustable bracket on the port side of the transom. The subject boat for this review was powered with an 8 horsepower 2-stroke Nissan. Other owners I have talked with report having outboards between 8 and 15 hp. Eight horsepower is more than adequate for inland waters while boats operating in areas with tidal currents, wave surge and potentially large swells might be better off with a 15 horsepower outboard. The Helms 25 handles well under power in both forward and reverse, so docking and maneuvering are relatively easy tasks. This characteristic is aided by the retractable centerboard, allowing the captain to raise the board when under power and thus reduce drag and keel depth for responsive steering. 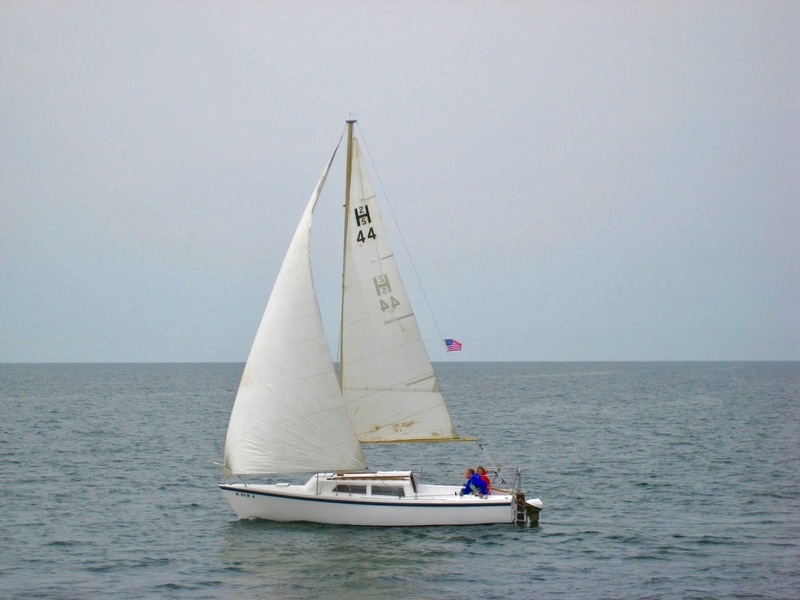 The particular Helms 25 that is the subject of this review carries a sail inventory which includes a 125 square foot mainsail, 225 square foot 150% genoa, 160 square foot laper/jib and a 400 square foot symmetrical spinnaker. In wind conditions up to about 15mph - 18mph, the main and genoa move the boat along nicely. She's an average light air boat and will achieve about 3 or 4 knots in wind less than 10mph. She feels just right in about 15mph winds and will move nicely at about 6 knots on a reach. The United States Performance Handicap Racing Fleet gives the Helms 25 an average rating of 240, which puts it right between the two target boats from Catalina. At wind speeds above 18mph, reefing and/or reducing headsail size should be considered. Reefing the main on a Helms 25 can be done by simply rolling the roller boom to furl in the sail until the reefing hook on the boom can be attached to a reef point on the sail. The leach of the mainsail also requires a reefing line. The mainsail can also be stored by rolling the boom to completely furl the main. The test boat did not have a roller furling headsail, so a crew member must go forward on deck to change the hank-on headsails. The side decks on the Helms 25 are rather narrow and are almost impassable near the chainplates. Experience says that it is safer to go forward by crawling over the coachroof than by using the sidedecks. The Helms 25 will handle moderate seas with comfort and confidence. She cuts through most waves and swells with ease and rarely slams. However, weatherhelm is fairly quick to develop so the helmsman and crew must learn the nuances of sail trim and traveler positioning to minimize this effect. She is not the greatest boat for pointing high into the wind, though she'll run downwind very well with the centerboard retracted to reduce drag. Care should be taken with a stern or quartering sea because the large cockpit does not have adequate drainage to quickly bail water. Early models have just two small scuppers in the front of the cockpit that drain via a single hose out of a single thru-hull on the transom. Later models have the scuppers moved to the rear of the cockpit and have additional drains on the forward corners of the cockpit benches to help drain rain water. Rainwater collects in the corners of the cockpit benches on earlier models. Adding drains is a fairly simple task and helps ensure a dry cockpit. The Helms 25 has very few areas that can allow seawater to enter the boat. One area is the transom thru-hull that serves as the drain for the cockpit. The other areas are the pipe through which the centerboard cable travels and the centerboard pivot bolt. However, both of these are typically above the waterline and present minimal risk for water intrusion though they should be inspected on a regular basis. The paucity of thru-hulls on the Helms 25 leads to the conclusion that rain rather than seawater is the enemy (see note on cabin windows below). As with any boat, particularly a boat that is 30 years old, a careful inspection and/or professional survey should be done prior to purchase. Be sure to inspect the centerboard pivot bolt and seal as the bolts can corrode over time and the seal can suffer from dry rot. Replacement is difficult and requires the boat to be hoisted so the 300-pound centerboard can be removed. Also check the centerboard winch and cable for signs of wear and meat-hooking. As is typical of all cored decks, you will want to inspect for soft spots and water intrusion around deck hardware, particularly around the lifeline stanchions and chainplates. The cabin windows on Helms 25s are also known to leak and require complete removal and resealing to fix the problem. While this is not a terribly difficult job and should not be a deal killer, it should be noted during the inspection. While Helms 25s are becoming more and more rare in the pre-owned sailboat market, good examples can still be had anywhere from $1000 to $7000. Many will require some work, but what boat from the 1970's doesn't? In fact, what boat, no matter the vintage, doesn't require some work? For a boat built in the 1970's by a small company that is no longer in business, the Helms 25 has held up tremendously well, both stylistically and structurally over the years. Credit Jack Helms and his cabinet making background and attention to detail for much of this. The Helms 25 offers good value in a large but manageable trailer-sailor that can serve as a great gunkholer and weekend getaway while still offering plenty of good sailing characteristics to please even the avid Wednesday night racer. She is also blessed with a lot of storage and roomy berths for the weekend cruiser. There are not a lot of choices in the 25 foot trailer-sailor category that feature a shallow draft, decent sailing ability and moderate cruising comforts for a very modest budget. Fortunately, the first boat ever offered by Jack Helms fills the void. Thank you for the detailed review - this is great!! I knew Jack Helms.The first boat I ever bought was a 12-foot Helms plywood Penguin, which had belonged to his daughter Jan. Jack began building fiberglass boats in about 1963, and I bought a glass Penguin from him also. He also made 19-foot Lightnings back then. Jack had played professional baseball, and he was strong as an ox. His wife was a beauty queen, a lovely and highly intelligent woman. What a couple they were. When Jack had an aneurism on his aorta, he knew the handwriting was on the wall, and he divested himself of everything in his yard. He sold me a 34-foot Creekmore hull and told me, "Start from the bow and work your way backward, and you'll know what to do." It worked, and my Creekmore schooner sailed well and was my home for two years. Thanks for the personal insights on Jack. Sounds like he was a 'jack' of many trades. I have the first Helms 25 on Lake Norman in North Carolina and the 38th boat built by Helms. She is a fine boat and still sailing Lake Norman today. 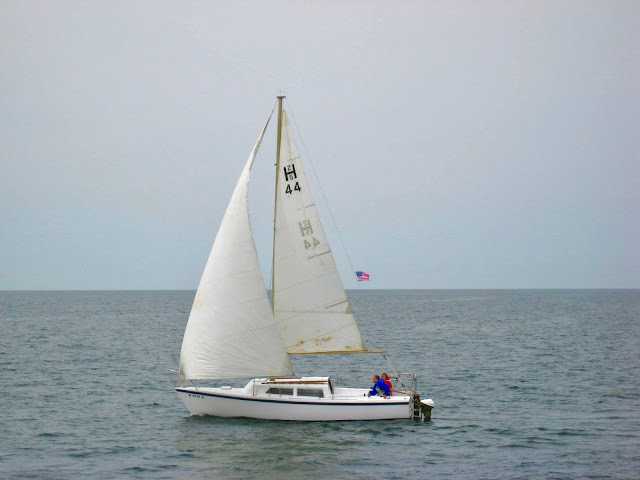 I loved our H25, both because she was our first and because she's a simple, reliable sailboat that's easy on the budget. Hi Chad. I (Kevin) wrote the review. The Sailblogs blog was my original blog back in 2007-2008, but I've since migrated over to SailFarLiveFree.com.